Suite Sports: Is Adrien Broner the Next Mayweather? Is Adrien Broner the Next Mayweather? Adrien Broner is quickly becoming the most hated man in boxing. However, like his mentor Floyd Mayweather, we're finding that, while you might hate him but, you're going to watch him. Broner now has the two most watched cable fights of 2013. His split decision win over Paulie Malignaggi Saturday night for the WBA welterweight title drew a peak of 1.3 million viewers during Showtime’s broadcast. That fight was surpassed only by Broner’s lightweight bout with Gavin Rees back in February, which drew an average of 1.4 million viewers for HBO. The trash talk leading up to the Malignaggi fight seemed to work for Broner and Showtime. Like Mayweather, viewers are likely tuning in to see Broner lose. But, regardless, they are tuning in, and that’s what matters to Showtime. 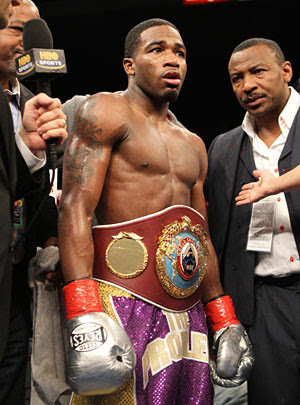 Broner is young, charismatic and talented, but has little class or respect for others. He appears to be boxing's perfect villain to succeed "Money" Mayweather. Broner, who moved up two weight classes to take on Malignaggi, seemed comfortable fighting at his new weight, and was never really in any serious danger against the light punching Malignaggi. If Broner decides to stay at welterweight, the question must be asked: Will he fight Floyd? Broner has said that he won’t fight the pound-for-pound king because the two are close friends and he has too much respect for Mayweather. However, with Mayweather’s mega-fight coming up in September against Canelo Alvarez (A fight with an outside chance of becoming the highest grossing pay-per-view fight of all time), it’s hard to imagine that Showtime won’t press Oscar De La Hoya to make Mayweather-Broner happen after seeing those returns. Stephen Espinoza, the executive vice president and general manager of Showtime Sports has led a ratings revival since his hiring in November 2011. The four biggest audiences for a single bout in Showtime history have come in the past 10 months with Espinoza at the helm. Showtime Sports, which has basically become "Golden Boy Television," is completely dependent on Oscar De La Hoya and the marketability of his fighters, especially his young fighters like Broner and Alvarez. The company is doing a good job of marketing Broner as the egotistical, self-centered and even womanizing jerk, while Alvarez plays the role of the classic soft spoken good guy who is also easy on the eyes. No matter the outcome of Alvarez-Mayweather, a fight between Broner and Alvarez would draw big numbers down the road. The relationship between Golden Boy and Showtime is going better than expected and the possibilities seem endless at this point. Showtime is making a hard push to steal away boxing fans from HBO and Top Rank by broadcasting events on the same night, and even forcing them to switch dates for their Marquez-Bradley PPV event by putting Mayweather-Alvarez on that same night. Showtime and Golden Boy should be feeling good, but this fight is far from over. Bob Arum (CEO of Top Rank) seems to have tapped into a new found Chinese market which recently lifted its ban on the combat sport. With a high interest in the sport and the obvious huge population, the Chinese market could be worth billions. Arum has also teamed up with boxing’s newest heavyweight promoter, 50 Cent. Knowing the history between Floyd and 50, we know that the rapper will do what it takes to upstage his old buddy. Even though Top Rank and Golden Boy won’t work together, boxing fans should be treated to high quality entertainment, as both companies will now be aggressively trying to outdo the other. Expect big fights in the 2nd half of 2013, and they'll to only get bigger to kick off 2014’s boxing season.